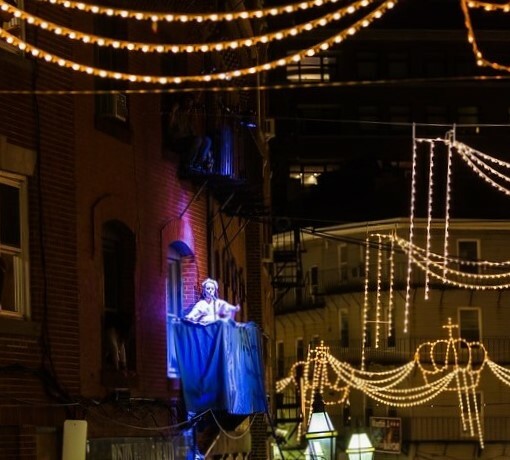 Last August, I wrote about the annual Feast of St. Anthony that takes place in Boston’s Italian North End. Called “the Feast of All Feasts,” it’s the culmination of the summer season’s celebrations of faith, Italian culture, and food – and the biggest block party you could ever imagine. However, this year, on the Sunday night prior to the St. Anthony Feast, I ventured down to North and Fleet Streets for the Fisherman’s Feast because an Italian-American friend promised me a spectacle “unlike anything you’ve ever seen!” She wasn’t kidding. 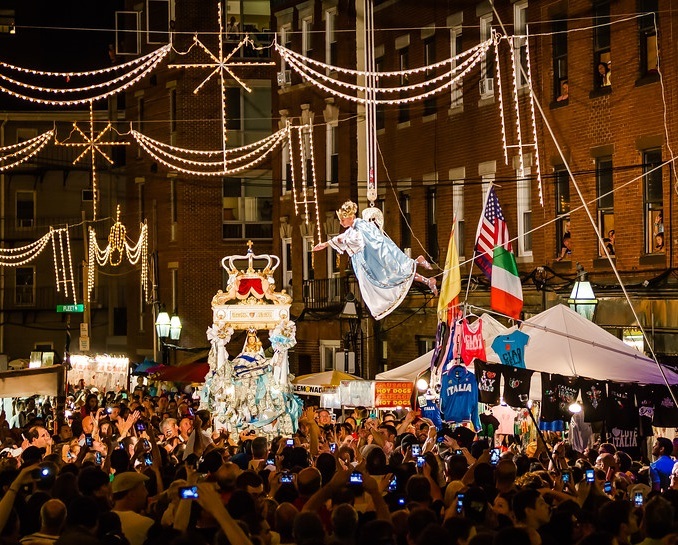 The tradition of the Fisherman’s Feast was brought to Boston by Sicilian immigrants in the early 1900’s to commemorate the fishermen’s great devotion to the Madonna del Soccorso (Our Lady of Help). Every August, to coincide with the Feast of the Assumption of Mary, the Flight of the Angel takes place at the conclusion of the Fisherman’s Feast. A large crowd gathered at dusk, awaiting the arrival of the statue of the Madonna and the little angels who pray to her. Trumpets played and everyone cheered when the statue of the Madonna approached. Spotlights shone on two skirted third-story balconies, directly across from one another. A little girl dressed as an angel appeared on one of the balconies and began praying in Sicilian. Soon, the second little angel appeared on the opposite balcony. With the help of some elaborate cables, she began her descent until she was lowered down to greet the statue. Still suspended, she also prayed to the Madonna. The crowd went wild cheering and throwing confetti. But what was truly remarkable about this scene was not that these little girls had memorized a rather lengthy prayer in Italian, or how the many hands holding the cables did everything with such care and precision, or even how beautiful the statue was. It was extraordinary to witness the devotion of so many people, and the great sense of community that devotion had inspired. Younger people made spaces on the crowded street and sidewalk for older folks, as folding chairs seemingly appeared as if by magic for these elders. Adults lifted children up – not even their own children – so the youngsters could get a better look. And despite the lack of a significant police presence, when the ceremony was over, the thousand-plus crowd disbursed in a respectful and organized fashion. I’m sure the Madonna del Sorrorso was smiling down on all of us. 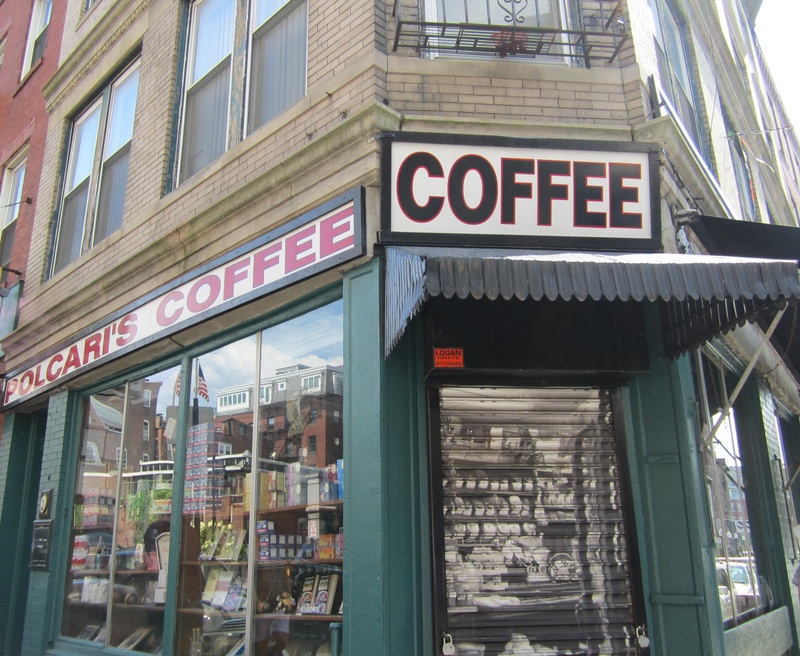 The North End is Boston’s Italian neighborhood. Salem, Parmenter, and Hanover Streets are lined with restaurants and shops, all celebrating Italian culture, and more importantly, Italian cuisine. I often go there on Saturday afternoons and, as I make my way from the cheese shop, to the fresh pasta store, from Polcari’s Coffee (where I get my spices), to Bova’s Bread, I am met with smiles and nods. None of these merchants know my name; they call me figlia mia (daughter), bambola (doll), or bellezza (beauty). Recognizing me as one of their own, the second and third generation Italian-Americans who live and work in this colorful neighborhood treat me like some kind of Mediterranean goddess. Whenever friends visit from out-of-town, they always want to have dinner in the North End. Then after some wine and good food, we walk about, as I point out the Old North Church, the statue of Paul Revere, and St. Leonard’s. Afterward, we stop by a café for espresso and pastry or gelato. Despite all there is to love about this romantic and magical neighborhood, right now is the best time to go there. The Feasts begin in June and continue throughout the summer, but the Feast of all Feasts is the St. Anthony Feast, in late August. Locals, suburbanites, and tourists come out. Italians, Italian-Americans, and Italians-for-the-day line the streets. Vendors sell pizza, sausage-peppers-and-onions, cheeses, zeppole, cannoli and pastries of all kinds. But not to worry because whatever you eat while standing up has no calories. Music and laughter abound as generations of family members celebrate. As the parade makes its way down the old and narrow cobblestone streets, the large statue of Saint Anthony leading the way, balloons and confetti are dropped from apartment widows above. The crowd chants, “Viva Sant Antonio! Viva!” The faithful stand in line, waiting to pin money on the statue as they offer a silent prayer. It’s quite the spectacle. 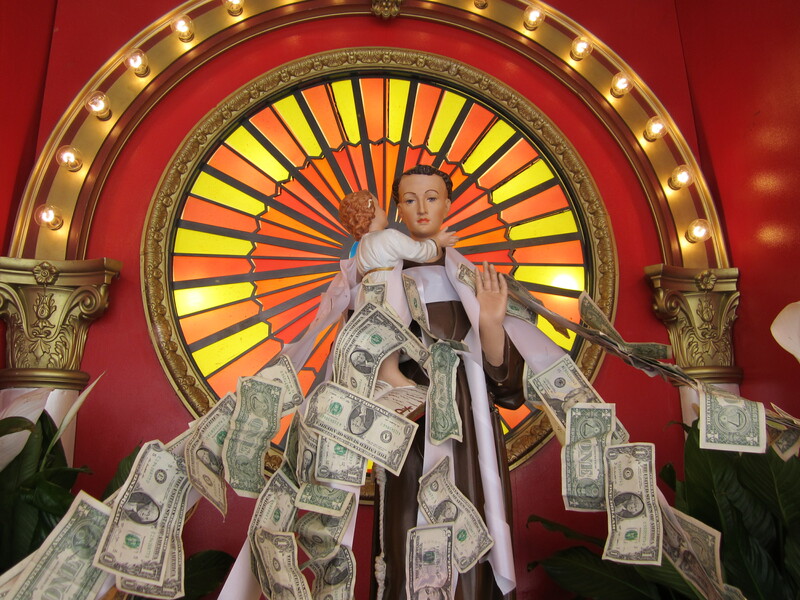 The Feast of St. Anthony takes place next weekend in Boston’s North End. I wouldn’t miss it.